This is the first initiative of its kind to focus on the suspected environmental causes of breast cancer. It will capitalize on the synergies of some of the best breast cancer research scientists in the world, all located in Boston. They propose to identify which chemicals cause breast cancer, to demonstrate how these chemicals induce cancer, and to understand how to prevent them from doing it. Provide compelling scientific evidence that these man-made chemicals cause breast cancer and its spread, and trigger cancer stem cells that may be responsible for the disease’s recurrence and death. Further develop a high-tech, high-throughput, genomic platform able to predict the carcinogenicity of thousands of as-yet-untested chemicals. Expand public awareness of these cancer-causing chemicals through published manuscripts in highprofile scientific journals and presentations to international scientific associations, targeted government agencies and funding organizations. Develop arguments for reducing exposure to carcinogenic chemicals. Potentially identify novel, non-toxic breast cancer therapeutics and preventatives. Generate future research grants through government sources and private donors. There is limited public funding for research on prevention of cancers. This undertaking will make a landmark contribution to our understanding of what causes breast cancer and how to prevent the terrible emotional and physical damage caused by this disease. In the world of medical research, results are measured in “baby steps”. One of the consortium’s primary goals is to expand public awareness of cancer-causing chemicals through published manuscripts in high profile scientific journals and through presentations to international scientific associations, government agencies and funding organizations. 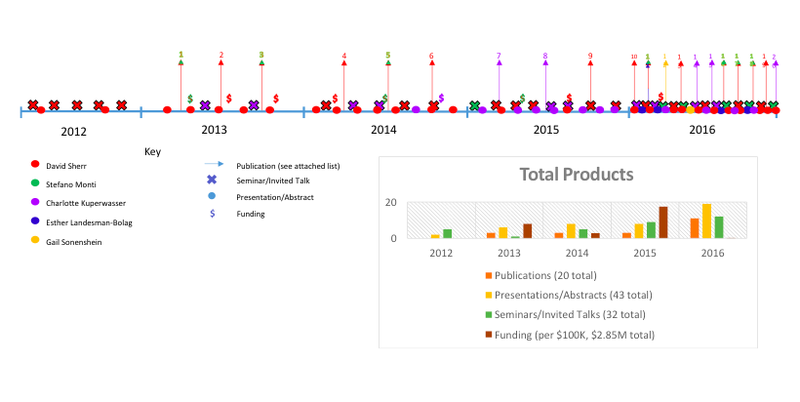 The timeline below demonstrates the impact that the onset of Find The Cause funding has had on the each lab’s success.